Meet Lisa… a 37 year old woman from New Jersey. I read about her a few years back in my favorite magazine, Real Simple. Lisa and her husband, Alex, moved into their 1920’s Colonial home about seven years ago. The outdated kitchen with minimal shelving and no pantry created chaos. Space was so limited that chips and snacks were crammed in the bread drawer. The shelves were so deep and dark that Lisa found herself buying duplicates of canned goods because she couldn’t find what she needed. “I was going crazy!” she says. Sound familiar? Can you relate at all? To solve their problem, the couple renovated their kitchen, adding more shelves and a pantry. While not all of us have the luxury of remodeling our chaotic space, there are a few other solutions we can learn from that Lisa tried to cut back on the clutter. Next, Lisa instituted a “feed what you need” policy. She began shopping only for items needed to make a week’s worth of meals, plus any staples, like sugar, that they would run out of. 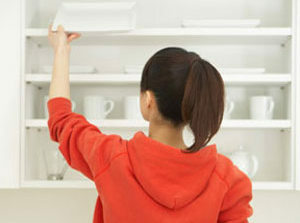 • Visual clutter on the counters, such as car keys and vitamin bottles, or kept out of sight on a specific shelf. • Mail is sorted the day it comes into the house, then put into an in-box on the desk in their home office. • Nothing is allowed on the dining room table when it’s not in use except a vase.